At this center, mainly faculty of the Department of Developmental Psychology and clinical psychology specialists conduct practical clinical psychology, research and student training from a developmental and psychoanalytical perspective. The center deals with children ranging from infants to adolescents with a broad spectrum of developmental disorders and emotional disorders, as well as their families. It seeks to understand the children’s problems from many angles through observation, interviews and psychological tests, then uses that understanding as a foundation for therapeutic education, play therapy, counseling, music therapy and academic guidance counseling. Classes related to clinical psychology provide students with opportunities to participate in and observe therapeutic education and music therapy that are conducted at the center. Also, there are opportunities for students to request to observe clinical training at specialist facilities and educational facilities linked to the center. 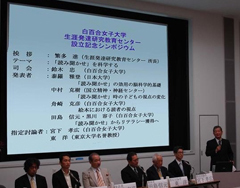 This center was established to be open for researchers at this university and throughout Japan and the world to engage in various types of enterprises necessary to promote foundational and practical research related to lifespan development. It aims to collect basic data and build databases to improve the practice through collaborative research and businesses with researchers within and outside of the university and people in charge of research and education at local education authorities, government organizations and private enterprises. Toward that end, in addition to providing a place for the constant exchange of research and lively exchange activities, it reports the results through publications and proceedings. Based on the results of the above activities, the center also conducts practical activities such as educational counseling for parents, and training for nursery, kindergarten, primary school, and junior and senior high school teachers. Because graduate and undergraduate students participate in and promote these activities, they learn methods for the practice and research of developmental psychology. This center is a gathering place for undergraduate and graduate students as well as alumni. The center serves as a venue for research meetings and lectures; conducting research projects; publishing “Research Center News ”; collecting, organizing and studying reference and research materials; and reporting the results of research in the “Studies of Research Center for Children's Literature and Culture, Shirayuri University”. From time to time it publishes results of research in both the “Academic Papers”, “Series of Shirayuri Research Center for Children’s Literature and Culture”, etc. With approximately 35,000 volumes, the large collection of books is one of the main features of the center. 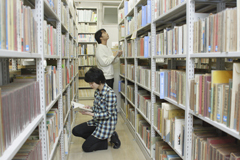 Together with the main library it has the valuable collections of the Hiroyuki Tomita Collection, the Natsuya Mitsuyoshi Collection and the Fraser Collection. This center supports the studies of individual undergraduate and graduate students by providing an environment where they have easy access to leading edge research in children’s culture and literature and reference materials. The purpose of this center is to facilitate mutual study of faculty and graduate students in the Department of Japanese Language and Literature, the Department of French Language and Literature and the Department of English Language and Literature and to contribute to the advancement of their research. The center endeavors to deepen research related to language and literature through activities such as the publication of the annual research paper collection “Studies in language and literature”, hosting lectures and a variety of research meetings, managing research projects, and collecting research material. It plays a central role as a venue for collaborative research in the three departments as they investigate the increasingly interdisciplinary direction in which language and literature research has been developing in recent years. The Research Center for Language and Literature has a permanent staff of research assistants to advise students who are interested in language and literature research. This center engages in a broad range of activities in its aim to disseminate research results including a variety of Christianity-related research subjects, ideologies, culture, etc. and the spirit and educational ideals on which this university was established both within the school and beyond. It provides a venue for the presentation of research through the annual publication of the “Shirayuri University Christiano-Cultural Academic Papers” and the biannual bulletin “Chronica”. It also hosts regular research meetings and research presentations. Additionally, the center places an emphasis on external activities such as lectures, debates and the chapel organ and meditation. The valuable collection of books at Christian Culture Center is available for use for people not connected with the university.